PurpleSun can be quickly deployed in operating rooms to use UV light technology to disinfect equipment. 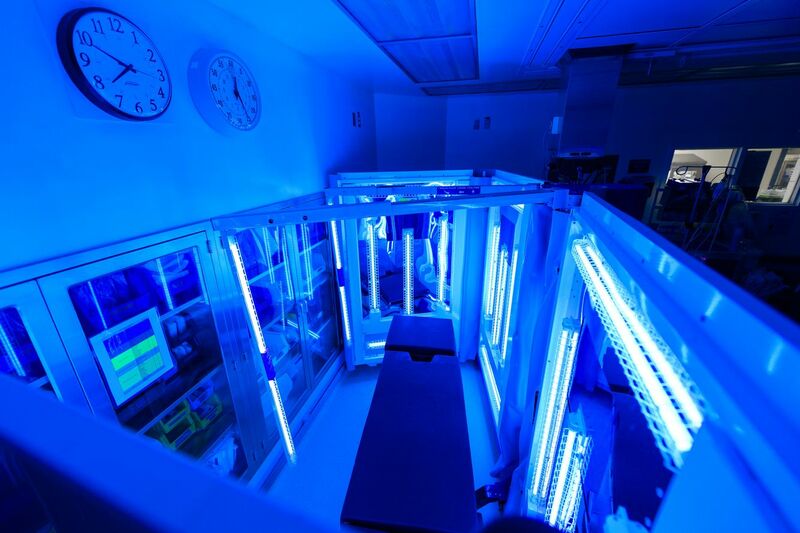 Using ultraviolet (UV) disinfection technology to reduce the risk of hospital-acquired infections eliminated up to 97.7 percent of pathogens in operating rooms (ORs), according to a study published in the American Journal of Infection Control. The study examined a UV light technology platform deployed by New York-based PurpleSun that can be used for a range of disinfection applications for ORs, patient rooms and other health care settings. Unlike other disinfecting tools, which includes chemicals that can take minutes to inactivate pathogens and at times can leave bacteria on surfaces due to human and product error, PurpleSun reaches multiple surfaces in seconds with UV light. The study found that it all but eliminates human and product error in the proliferation pathogens that can contribute to the spread of pathogens that contribute to infection. PurpleSun’s focused multivactor ultraviolet (FMUV) device can be deployed to surround equipment on all sides, with foldable partitions whose light hits five different surface points and uses higher levels of UV intensity in 90-second intervals. More than 3,000.microbiological samples following 100 different surgical cases were taken in and around the ORs at three different hospitals in the New York metropolitan area. The observational study is believed to be the first to use five-point multisided sampling in testing the effect of UV disinfection technology. Dr. Armellino says the intent of the study was to determine if UV technology reduces environmental pathogens for the purpose of making health care facilities safer and improving the patient experience. Dr. Armellino’s co-authors were Thomas J. Walsh, MD, and Vidmantas Petraitis, MD, both of Weill Cornell Medicine of Cornell University; and Wladyslaw Kowalski, PhD, of Purple Sun. The trial utilizing FMUV was conducted at Long Island Jewish Medical Center in New Hyde Park. Northwell’s for-profit entity, True North Enterprises, is an investor in PurpleSun. To view the study, click here.